Sitting down with a true Alaskan, mayor of North Pole Douglas Isaacson, was a real pleasure and with all the interesting facts and information about the town, area and region – we just had to share it with you. So get ready to learn about a great state that, aside from a few really general things like “no daylight” and “whale watching”, not too many people really know too much about. Winters in Alaska Are Fun! Believe it or not, there is more to do in Alaska than to watch whales and wait for the few hours of daylight to pop around. 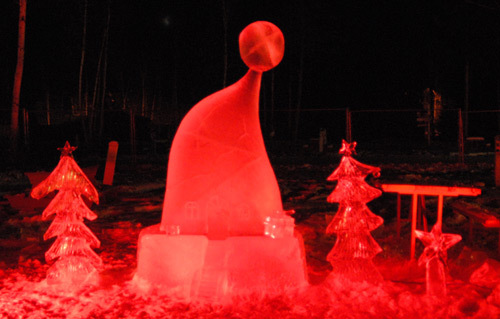 Since North Pole, Alaska is considered the Christmas capital of the world, in a sense, the winter wonderland keeps its holiday stature all year round. 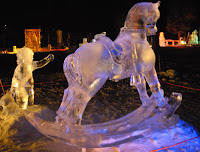 Though you will not find skiing as a winter activity in the great state, you will find amazing ice sculptures that are created by artisans from around the world and celebrated globally. Here’s a link that shares the incredible designs and structures that are all centered on Christmas themes. Aside from Santa (you can catch a glimpse of him on the Santa cam here) people that live in the North Pole feel it’s a great place to live. 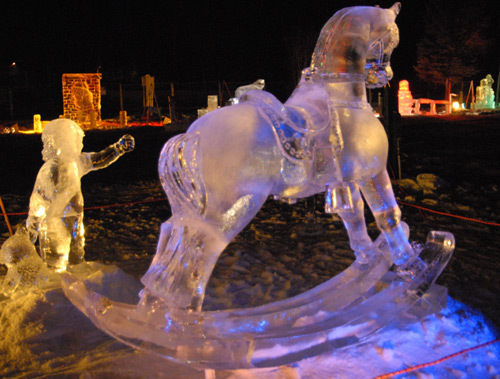 Located in between two military bases, the city is Southeast of Fairbanks, Alaska. Keeping with the Christmas theme and reputation for being Santa Claus’ hometown, you will find plenty of holiday decorations, year around. There are many street roundabouts that are decorated with candy cane light posts and thousands of lights. One thing that proves very challenging for residents of North Pole is the cost of electricity. An astronomical $1000 or so each month to power (including heat) the average 2,500 square foot home is typical. Compared to the lower 48 states, this is almost four times as much in many cases. If you do decide to move to the great state of Alaska, particularly to the North Pole area, the cost of an average home is currently about $225,000. Contrary to popular opinion, there is a reasonable amout of daylight in the region and even during the winter solstice when the days are shortest of the year, the extremely bright moonlight illuminates the entire area fairly well. Situated about 120 miles south of the arctic circle, North Pole does have limited daylight of only three hours but temperatures are deceivingly warmer than they may appear when you factor in the “what it feels like” scale. Where in the Midwest, for example, the wind chill factor might make a 37-degree day feel more like 20 degrees – the opposite holds true for this part of Alaska. There are a lot of beautiful aspects to life and time spent in Alaska – such as the extraordinary fishing industry and everything that goes along with it. Though not commercial fishing, there are plenty of opportunities for recreational fishing. To learn about licenses that are required by the state, visit the official Alaska website. If you travel during the week of July 4th when it is hot and humid in most states, you’ll be pleasantly surprised by the comfortable temperatures and wonderful festive activities planned each year in the North Pole. The summer festival includes lot of fun for families, including a parade and fair-like atmosphere. If you are looking to explore new potential places to live or visit – you should definitely go to Alaska, making it a point to try to see as much as you can while there. Amid much natural vast beauty is the fabric of the region, it’s diverse cultural melting pot of people ranging from Native Americans to Russians and so many more. Considering purchasing a home there? Be sure to check with your local Realtor who can help you find the perfect agent up there with experience in anything from military moves to long-distance relocation and of course one that is well versed in the Alaskan landscape.